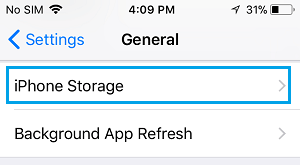 You do not have to wait till you see ‘Not Enough Storage’ message on your device before making desperate attempts to free up storage space on iPhone or iPad. A better approach is to check the storage status on your device and free up storage space on your iPhone from time to time. Managing with an iPhone with limited storage capacity can be difficult, considering the fact that up to 5 GB of storage can be taken up by the operating system and system default apps. Over a period of time, the remaining storage space quickly gets filled up leading to ‘Not Enough Storage’ error message on your device. Once you start getting this error message, you will not be able to take photos, record videos, or download new apps until you free up storage space on your iPhone by deleting images, videos and other data from your device. You will find below the steps to check the current storage status on your device and the steps to free up storage space on iPhone or iPad. Follow the steps below to check the current storage status of your iPhone. This will provide you with an immediate reading of how much storage space has been consumed on your device, and how much is available for use. On the iPhone Storage screen, you will be able to see the amount of storage space used on your iPhone. If the remaining amount of storage space is less than or very close to 1.3 GB, you need to take the steps as listed below to free up storage on your iPhone. You can make a really good start to free up storage space on your iPhone or iPad by simply turning of the Photo Stream option on your device. To turn off Photo Steam, tap on Settings > Photos > on the next screen turn OFF Photo Stream by moving the toggle next to My Photo Stream to OFF position. Photo Stream causes photos from other devices to show up on your iPhone and this takes up storage space. For example, if you are using your iPad to shoot Photos, the photos from the iPad will also show up on your iPhone and take storage space. It is not uncommon to download apps that look interesting and later on forget all about them. Now that you are on a mission to clear storage space on your device, it makes sense to find all such unused or sparingly used apps and just delete them from your device. At this stage, a good rule of thumb would be to delete all apps that you have not used in the past 3 months. In case you have not used these apps so far, it is more than likely that you don’t really need these apps and you are never going to use them. Over a period of time app related data starts accumulating on your iPhone and ends up taking a lot of storage space on your device. This app related data will be listed as “Documents and Data” on your iPhone and needs to be cleared from time to time in order to recover storage space on your device. For most users, the Photo’s app is easily the biggest consumer of storage space. You can recover tons of storage space just by deleting photos from your iPhone or iPad. A quick way of doing this is to simply transfer Photos from your iPhone to PC and bulk delete all the images on your iPhone. Whenever you have the time, you can take a look at the photos saved to your PC and decide which ones you want to keep and which ones to delete. In case you have the HDR Mode turned ON, your iPhone is saving two copies of the same image on your device (Original image and its HDR version). In order to avoid cluttering your iPhone with duplicate images, you need to set your iPhone to automatically delete the original photos and save the HDR version. Tap on Settings > Camera > On the next screen, disable the option for Keep Normal Photo by moving the toggle to OFF position. With this setting, your iPhone will only save the HDR version of the photo, instead of saving both HDR and Original Photos. Note: This option is suitable in case you are happy with HDR images as produced by your iPhone. The other option is to go through photos manually and decide which version you want to keep and which one to delete. It is quite possible that you may like the original version of a photo compared to its HDR version. It is common for those who travel or commute long distance to download TV series, Movies or Music Videos to their iPhone or iPad. However, the problem is that some users forget to delete the Videos after watching them and there are others who get attached to these downloads and refuse to delete them. You need to be aware that Videos take up lot of space, in-fact a single HD movie can end up consuming as much as 3 to 6 GB of space on your device. The Photo Stream Feature on your iPhone allows you to create and share photos with other people. This is a great way of keeping in touch with your friends and relatives. However, you need to be aware that joining other people’s photo stream causes photos of other people to appear on your iPhone and consume storage space. As a music lover, you may have hundreds (or thousands!) of songs on your iPhone or iPad. However, you need to be aware that keeping scores of song albums on your device is taking up storage space. In general, books do not take up much storage space on your iPhone or iPad. However, these can add up in case you download tons of free and paid books to your device and never delete them. Messages with all their attachments can start taking a lot of storage space on your iPhone. 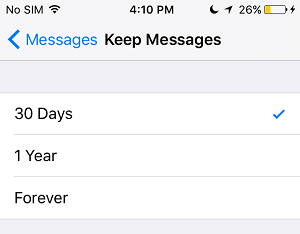 You can either get into the habit of manually deleting messages on your iPhone from time to time or set your iPhone to auto-delete messages after a set period of time. 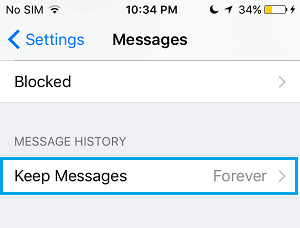 Tap on Settings > Messages > On the next screen, scroll down to Message History section and tap on Keep Messages. It never occurs to many users that Voicemail Messages might be accumulating on their iPhone, taking up storage space. This is especially true for those who use their iPhone for business purpose, getting tons of voicemail messages that never get deleted. Open the Phone app on your iPhone and tap on Voicemail tab located in the bottom menu. 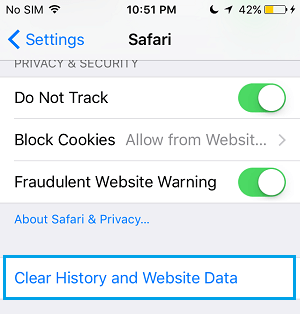 You can recover some storage space on your device by deleting Safari history and cache. While this space may not be large it does add up to saved space. You will see a pop-up, tap on Clear History and Data option. Hope you find these tips useful in recovering storage space on your device.